Addendum: This contest is open only to those living in the US, due to cost of international postage. If you are someone living outside of the US that has entered this contest, please know that I am not being discriminatory, in exempting you from winning. It is purely a pragmatic reason for doing this. It may seem like a bit of a mouthful, but in July, we will be featuring book reviews of various books starring female magic wielders, or books that offer a fascinating new vantage on the concept of female magic wielders. Whether we like it or not, there is a perplexing element of gender, when it comes to magic. Why are witches and wizards call as such? Why are wizards often seen as more venerable, and witches are often denounced as irredeemable evil incarnates? What is the difference between warlocks and witches, or wizards or witches? Linguistically, what is the etymological roots of these words, what different connotations do they have? Are they really always gender exclusive? We’ll discuss Shakespeare’s The Tempest, and the origins and history of magic, the history witch burnings, etc. More importantly, we will allow contemporary fantasy books to guide us into the literary history of female magic wielders, how have the roles of female magic wielders evolved in contemporary fantasy. This Wednesday, we are starting this month earlier with a review of Emily Croy Barker’s whimsical, wildly entertaining novel The Thinking Woman’s Guide to Real Magic. A Bibliophile’s Reverie is indebted to Emily Croy Baker, in a sense, for sparking the idea of this blog theme. 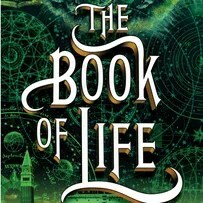 More importantly, it is more relevant than ever with the forthcoming release of Deborah Harkness’ Book of Life, which has a very deep exploration of feminine power and its connection with magic. On July 15, 2014, we will feature an extensive review of this very exciting book right at midnight. I am very excited to offer my own opinion and analysis on this book, and how it offers so many interesting points of discussion to the evolution of female protagonists and the ways that we feature magic in our fantasy novels. Viking/Penguin was kind enough to allow this blog to feature this really awesome giveaway, that may make your heart skip a few beats, after you hear the details of the prize. Now, the contest will end on the last day of July, giving enough people time to really read and digest all of the posts throughout the month, related to Female Magic Wielder Month. So, click either of the images of Diana Bishop’s commonplace book below to enter for your chance to win, by using the attached Rafflecopter App!! I really like this blog. I’m glad I found it through AST! Diana Bishop, but I also love Good Alsop. Diana Bishop is my favorite magic wielder. She’s such a great character and I love this series. I also really like the witches in Maggie Shayne’s Portal series – beginning with Mark of the Witch. Looking forward to reading these blog posts, as I’m always looking for good stories about witches. Diana Bishop and Luna Lovegood. I don’t know if I have a favorite, but I absolutely echo other choices like Hermoine and Luna from the Harry Potter series. I also like Katsa from Kristin Cashore’s “Graceling,” Fire from Cashore’s “Fire,” and Yelena from Maria Snyder’s Study series. Diana Bishop de Clermont is my favoirite magic wielder. She more than wields, she weaves and deftly spins her magic to create new things. Diana Bishop is my favorite magic wielder! She came from being Spellbound to discovering she was a weaver and took it all in her stride! I like both Sarah and Diana. They have different abilities so it is hard to pick just one of them. Female magic wielders? LOL let’s name someone contemporary, The Witches of East End were crazy in the book & are back on TV on Sunday. Favorite female Magic wielder has to be Diana Bishop !! Deb has written her character so well and woven her magic into strands of life that all of us should take to heart. Her acceptance of the unknown , tolerance of others unlike her and zeal of life cannot be matched. She lives everyday with a new viewpoint on life and love it is simply amazing to see what Deb will do in her final book in the trilogy ” The Book of Life” !!! Favorite magic wielder? Diana Bishop certainly, but I think Professor Harkness is the real magician! I really love Diana but Goody is a great one too. There are a lot of powerful witches in The All Souls Trilogy. Diana is becoming one herself, but I also enjoy the ones who played a mother figure to her – Rebecca, Sarah and Goody! Love Diana Bishop – and her relationship to Sarah and Emily – and also to Goody. Dianna Bishop is one of my favorite all time characters. I am so engaged when I read this series and am so happy that we are almost to the final book, and at the same time I am heart broken that it is coming to an end. This series is the only time I have ever reread a book. Diana Bishop is my absolute favorite female magic wielder! I’m also partial to Em and the other Bishop witches. Goody Alsop is pretty cool! I want to hang out in her kitchen! Diana and Hermione without a doubt! My favorite female magic wielder is definitely Diana Bishop.